County Hall, the headquarters of Durham County Council. Plans to convert a former cricket pavilion into a disabled-friendly holiday home have been given the go ahead. Councillors met to discuss plans for the derelict the former club on land near Miners Meadow, in Wheatley Hill. Proposals included creating a two-bedroom home with modifications for disabled people including a specialist hoist and bed. Despite planning officers calling for refusal over concerns the countryside could be impacted, councillors backed the plans. An application to convert the former cricket club and changing room was originally refused in January following an objection by Durham County Council’s tourism arm, Visit County Durham. 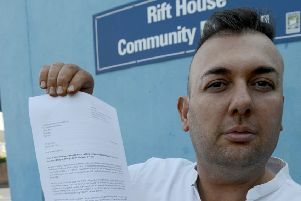 In recent months, a second bid was launched by applicant, Leslie Thompson, with a focus on providing disabled accomodation. Speaking at Durham County Hall, he shared his experience of being paralysed from the waist down and his difficulties around finding suitable accommodation. Council officers reccomended the plans for refusal over the concerns about the viability of tourism, due to the rural location and the impact of house-building in the countryside. Coun June Clark, said she was “aghast” at planning officers classing the area as countryside due to the housing history of the land while also stressing the need for more tourism. Coun Patricia Jopling added: “We do need this sort of accommodation to say it wouldn’t be viable you could say that about any new business. “That is down to the person with the experience of that particular disability to know whether that would be viable and I feel sure this would be. Principal planning officer, Alan Dobie, responding to concerns, said the application lacked an evidence base or business case and that the “disbenefits outweighed the benefits”. He added there were concerns that if the business folded, the building would fall back into a residential development use in open countryside. Following discussion, councillors launched a motion to approve the application. This was carried with 12 councillors voting in favour and one against.